Why You Need This: We are very excited to share with you these Honda CL / CB450 intake manifolds! After four years of searching we have found a solution. Straight from Japan, these intake manifolds are clean replacements for the rock hard originals on your Honda CL / CB450 or CB500T. Whether you call them intake manifolds, carburetor boots, carburetor insulator, isolators, intake pipes, carburetor holders or carburetor flanges, this is one of the very few parts that we change out on every vintage Honda CL / CB that we come across. Old intake manifolds are typically hard and cracked, which means that they do not quite seal like they used. Thus causing tuning and mixture problems that can make you go nuts trying to track down. Sold individually two intake manifolds will be needed per bike; gaskets are included. Add some stainless steel manifold clamps and your carbs will be sealed tight; full carburetor rebuild kits and carburetor gasket kits are also available for the CL / CB450 & CB500T. Note: These manifolds are symmetrical, rather than tilted as the factory originals. This causes the carbs to be tilted up a bit more when installed, which will make mounting the rubber boots from the factory air boxes more difficult to install. By applying a little heat from a heat gun the rubber boots can be softened up and worked to fit. Installation Tip: The manifolds were designed to be used in conjunction with factory style air filters to support the carburetors from both the front and back. If you are running pod filter it is recommended to fabricate a hanging support that holds the carburetors up and takes the weight of them off the the intake manifolds. 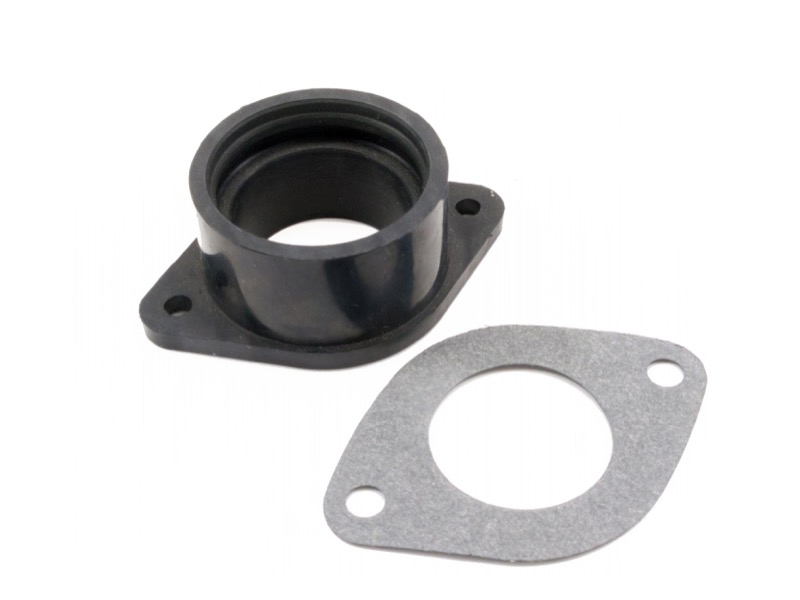 We have seen with time that the weight of the carburetor bodies can cause the intake manifold rubber to split from the mounting flange. Great parts. Fit well and perfectly described.